Bringing you greetings from rain soaked Texas today, and yes it is still raining. I am sure glad to see all of you and hope that you are having a wonderful week with awesome food to share with us today. Lots of picnic planning for the upcoming weekend and looking forward to spending time with friends and family. I am sharing a great Picnic Collection of 15 Recipes today and sure hope you will enjoy it. You're raining and we are dry. Send some rain over to NY we need it. Thanks for the party. Thanks for the party Miz Helen, it looks like you are all set for a Mem Day picnic! Hope you have a great Memorial Day Weekend! Welcome Summertime. Thanks for the party. I had to delete my comment because of misspellings! 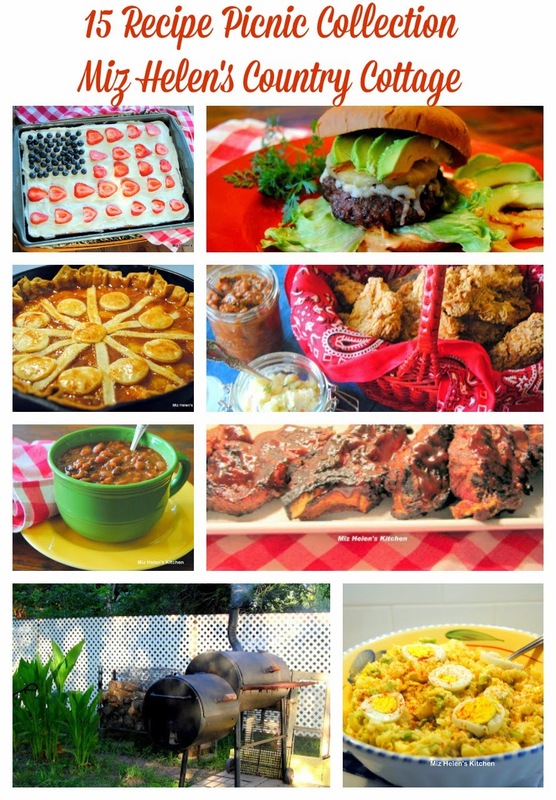 What great picnic ideas for Memorial Day, Miz Helen. I hope the rain holds off! Thanks for hosting your fun party and Happy Memorial Day to you and Leonard. And thanks so much for including my Chilled Sweet Pea and Mint Soup on your full plate this week! We are having a rainy day here in Chicagoland too. Stay dry and thanks for hosting, Miz Helen! 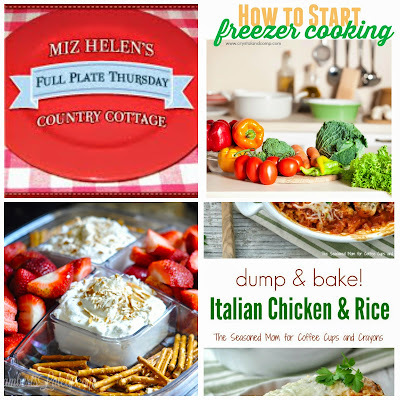 Good Morning Miz Helen, You have shared some fabulous picnic recipes which I am looking forward to making... there is nothing like trying out a new recipe. Have a wonderful weekend. Thanks for hosting!! Hopefully your rain will end for the weekend! Love your picnic ideas! I'd love to come to your house for food! YUM! It's been dry as a bone here! Everything looks so good, thanks for hosting! Have a great long weekend! Thank you for hosting, Miz Helen! I always have a lot of fun joining in your party. Have a great Memorial Day weekend! Thanks so much for hosting this great party. I'm thrilled to have a part today and look forward to sharing in the weeks to come. Have a wonderful day! Everything looks so good! Love the french toast! Thank you Miz Helen as always for doing this! I love your parties! Thank you so much for featuring my Italian Chopped Salad. Thanks, too, for hosting today's party! I love your picnic collection and I hope it stops raining so you can enjoy your delicious dishes outdoors this weekend! Thanks for the fun party and enjoy the long holiday weekend. Thanks so much for featuring Sweet Nothings. I so appreciate it. It poured down rain here too! Thank you for hosting such a delicious party! Enjoy your holiday weekend! Miz Helen, enjoy that rain! Have a safe weekend. I'm going to go visit some of these links right now, starting with #60. We're in northeast Texas - east of Dallas. No rain yet, but we'll get it later. Thank you for hosting Mz Helen!